Located on a perfect setting with a tranquil atmosphere, the adults-only Atlantica Golden Beach Hotel is specially designed for couples, honeymooners and solo travellers. 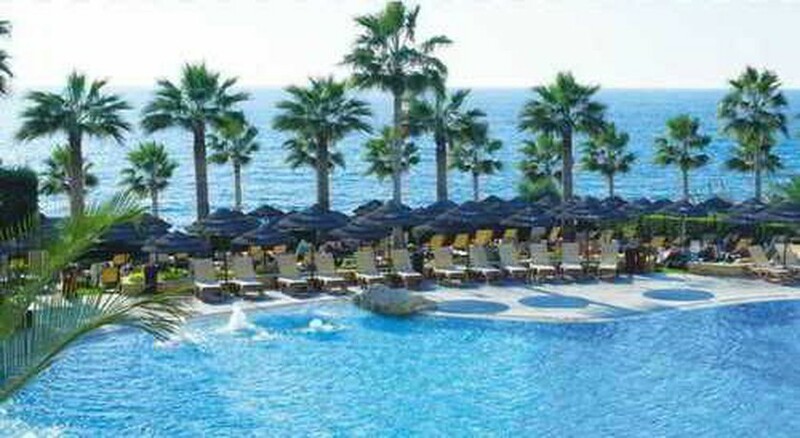 The hotel is nestled amid lush banana plantations in the picturesque resort of Paphos. With a clutch of contemporary-styled and elegantly designed rooms and suites, some overlooking the azure sea, staying at Atlantica Golden Beach Paphos offers the perfect luxury holiday. The hotel has a great dining scene with excellent buffet and a la carte restaurants serving local and international cuisines. There are two sparkling pools in the hotel, out of which one comes with a climate control option and plenty of sights to be seen in the exclusive surrounding area. The health club offers relaxing sauna, Jacuzzi and a range of body treatments, and the hotel's activities and programmes keep guests entertained throughout the day and evening. Situated beside a secluded pebble beach surrounded by banana trees, the Atlantica Golden Beach Hotel is an adult-only property that offers impressive sea views with a calm and relaxing vibe. The nearest village of Kissonerga is 1.5km with a small selection of restaurants and shops to browse. Within 8km is Paphos harbour which offers a romantic setting for couples who enjoy sunset strolls around the prom dotted coastline. The nearest airport of Paphos is 40 minutes from the hotel. The hotel offers classy and well-furnished rooms with world-class facilities that cater to all needs and wants. The rooms have been designed with couples in mind and offers perfect surroundings for romantic holidays. The facilities include a satellite TV, air-conditioning, en-suite, bathroom equipment, private pool in some rooms, internet connection and more. Plus, you can enjoy gorgeous sea views from your balcony or terrace. 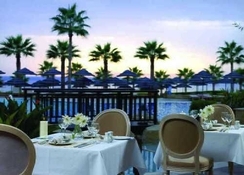 The hotel’s buffet restaurant offers authentic Cypriot cuisines and international favourites. You also have an option to dine al fresco on the pool-view terrace. 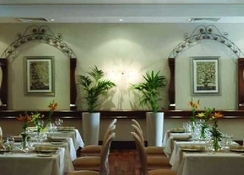 Choose from a four-course à la carte menu in the main restaurant including seafood kebabs and pan-roasted pork. There’s also a poolside bar that serves tasty, tropical cocktails right to your sunbed, whereas, Dionysos lounge offers soft drinks, alcohol and cold snacks with an occasional live performance to enjoy. 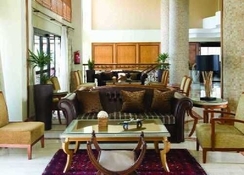 The hotel hosts a myriad of activities and programs for the guests. During the day, you’ll find various Gold daytime activity programs such as aerobics, lawn games and light sporting activities in addition to a tennis court. There are different live acts that take to the floor each night where you can expect dancers, comedians and bands. There is also an occasional live music show with drinks in the hotel’s lounge bar (don’t forget to look out for the special drink-of-the-day). The hotel’s outdoor pool is designed to mirror the ocean and features step-free sloped access and rock formations around its edge.